Farrakhan tells students: You are chosen to build a world! 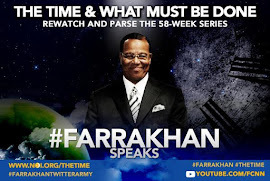 TUSKEGEE, Ala. (FinalCall.com) - Though some were unhappy with the Honorable Minister Louis Farrakhan’s presence, their efforts and weak protestations were drowned out by overwhelming support from student organizations, and prominent religious and political leaders here. Tuskegee Mayor Johnny Ford set the tone for the evening March 22, speaking to over 2,500 in the Gen. Daniel “Chappie” James Center, and leaving no doubt as to whether the Minister was welcome. (Top) Tuskegee University choir. (L) Min. Farrakhan pictured here with Tuskegee mayor Johnny Ford and attorney Fred Gray on Mar. 23. The night before, Mayor Ford presented the Minister with the key to the city and made him the honorary mayor of Tuskegee for life. (R) Min. Farrakhan pictured with members of the Muslim Student Association following their interview with him on Mar. 23. 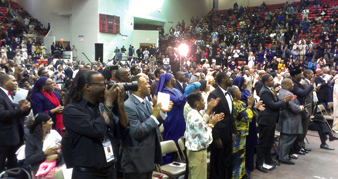 The crowd cheered loudly as Minister Farrakhan stepped to the rostrum and got right down to business declaring Tuskegee University is not simply an educational institution, but an entity that could play a key role in launching unlimited progress for the Black nation. Audience members listen intently to Min. 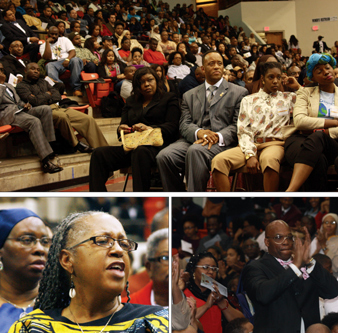 Farrakhan’s profound message at Tuskegee University’s Gen. Daniel “Chappie” James Center. Minister Farrakhan thanked his teacher, “the Eternal Leader of the Nation of Islam,” the Most Honorable Elijah Muhammad for leading him to the “infinite wisdom of God.” He surprised many in the audience by sharing how the Hon. Elijah Muhammad wanted to buy Tuskegee University in the early 1960s, even at one time meeting with city and university officials. His desire was to return the institution to the principles of thrift and hard work that were hallmarks of Booker T. Washington, who founded the school in 1881. Because of the fine research that has taken place over the years, including important groundbreaking agricultural research by George Washington Carver decades ago, many have become rich, however, Tuskegee, like many other historically Black colleges and universities is struggling. And though Tuskegee President Dr. Gilbert Rochon was pressured not to let Min. Farrakhan speak on campus and threatened with punishment in the form of millions in withheld aid for new building initiatives, the president and the campus extended a warm welcome and accommodated the Minister and all those who traveled with him. In the days leading up to the event, a lone member of the Tuskegee University Board of Trustees, Andy Hornsby, expressed displeasure regarding the Minister’s appearance and repeated old, discredited smears disseminated by the Anti-Defamation League and the Southern Poverty Law Center through the media. If the thought was words would scare students away, the idea was mistaken and false words once again were part of a failed, outmoded strategy indicating organizations were bereft of new ideas. A large crowd came to hear the Minister despite steady rains and delivery of the main message mostly to college students on a Friday night. Clearly, the community and students were seeking answers to problems, and wanted to hear solutions from Minister Farrakhan. The previous night in the historic Tuskegee chapel, nearly 600 gathered for a presentation featuring a DVD with highlights from Min. 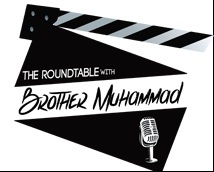 Farrakhan’s historic world tours and peace missions. He also spoke to students for nearly 45 minutes, then held a Q & A session. Demonstrations of support came from all levels of the Tuskegee community: The local NAACP sent a letter of support in favor of the Minister’s visit and circulated a proclamation. The Black Belt Deliberative Dialogue Group, a group that spearheaded the effort, responded with a positive YouTube posting. 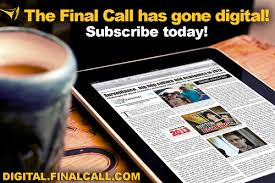 Members of the Group told The Final Call although their publicity and advertising worked, the actions of the enemies of truth motivated them to do even more to make the three-day event successful. The enemy’s fear of the spread of the Minister’s ideas was obvious, in fact, a spokesperson for the Montgomery, Ala.-based Southern Poverty Law Center was quoted in local newspapers speaking words to that effect. The Minister said those who fear truth and have misused and exploited Black talent and minds for centuries will always fear his words and ideas. Naked truth is running down a well-dressed lie, he noted. The enemies of the rise of Black people will not educate students to prepare them for rulership and oppose attempts to break the enemy’s grip, Min. Farrakhan explained. The slavemaster moved God out of the way, stood in his place and made Blacks call slavemasters “master” and stood in God’s place, he added. “And some of them today, still think they have that position, but I’m here to serve notice on you, God has come and there is no master for the Black man but Allah—God himself!” he stated emphatically as the crowd cheered. 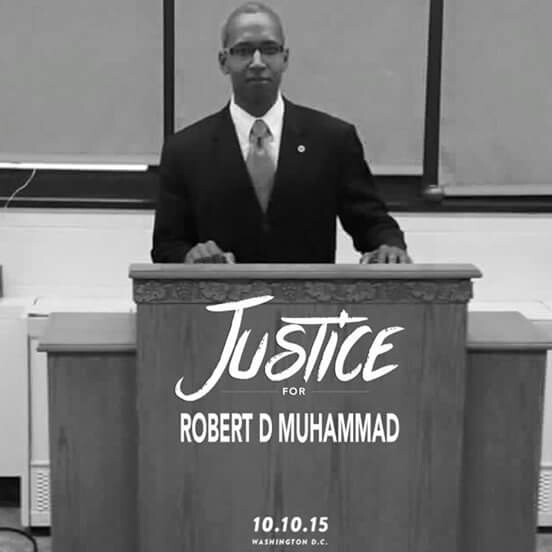 “That’s why the enemy says ‘don’t go near Farrakhan.’ Why shouldn’t they hear me? Because you know that what I have received from Allah, and the Honorable Elijah Muhammad, will free every mind and guess what? It will free your mind. In fact about it, you are on the cusp of your death. “Your world is collapsing around you, you have problems that you don’t have the knowledge of how to solve, and there is no institution that can give you the knowledge to solve the problems that this world has entered into,” the Minister added. 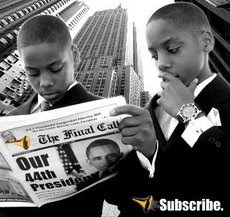 Old minds using outdated information and methods are unqualified to produce the new generation of leaders within the Black community, and the misrepresentation of Black leaders such as Booker T. Washington, Malcolm X, and Martin Luther King Jr. in the media and by historians has created misunderstanding among young Black students, and created difficulty in identifying famous Black mentors to pattern their lives after, he continued. The enemy pays lip service to Booker T. Washington but works to gradually destroy his ideas, in fact, Mr. Washington was often derogatively referred to as an Uncle Tom, which repelled Black nationalists from studying his ideas, noted Min. Farrakhan. When it comes to historical Black figures, the establishment only promotes Black leaders they’ve placed their stamp of approval on. The enemy will either water down the message, or engage in revisionist history, he said. They present “Martin Luther King (as) just a man who had a dream, and Malcolm X a man who said ‘by any means necessary’ without acquainting you with a body of knowledge that caused Martin Luther King to start evolving,” said the Minister. “You have his speech from ’63 but you don’t have his speech in ’68 before he was killed. You have Malcolm, Ballots or Bullets, but you don’t have the underpinning of the knowledge that transformed an eighth grade student into scholarship that whipped the best that Harvard and Yale produces." As a result, many Blacks are “White men and women in Black skin” whose minds must be reformed entirely before they will be useful to God in bringing in a new world, he said. The Minister commented on the high amount of government funding received by Tuskegee University ostensibly for research, but warned the investment is not as altruistic and well-meaning as it seems. A longtime advocate of independent education and institutions, the Minister said the Black community must be vigilant when approached by those proven in the past to be untrustworthy and often ill-motivated. The real haters have a brutal legacy of murder and violence aimed at Black people, said Min. Farrakhan. The real haters are working to limit Black progress and reduce the birthrate and population of the darker peoples of the earth, he said. 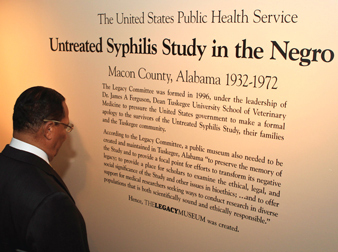 He recalled the legacy of the Tuskegee Experiment, in which Black men over a 40-year period, between 1932 and 1972, were subjects of a study to examine the progression of untreated syphilis. The men were told they were receiving free health care. He also talked about “HeLa cells,” the terminology used to describe the immortal cell line of Henrietta Lack which is used in scientific research. The Black woman died of cervical cancer, but her cells are used for research. Black people have a history of being used for medical testing and suffering while others get rich off of the research, Minister Farrakhan pointed out. 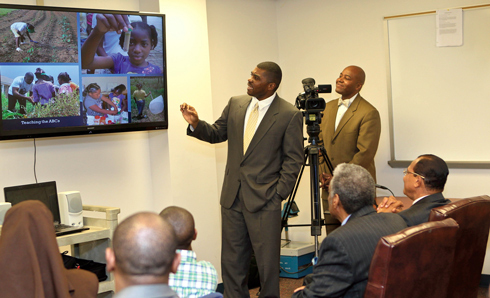 Usually the Minister’s visits to HBCUs are filled with activities and this three-day visit was no exception. It began with a wonderful reception hosted by Tuskegee University president Dr. Gilbert Rochon. Sitting on a little over 5,000 acres of land, 40 miles east of Montgomery, over 3,100 students attend Tuskegee University. According to officials, the university is the only HBCU to offer the Doctor of Veterinary Medicine (D.V.M.) and is fully accredited. The Mechanical Engineering, Chemical Engineering and Electrical Engineering Departments are all strong. The school boasts such prominent alumnae as singer Lionel Ritchie, former New Orleans Mayor Ray Nagin, actor and producer Keenen Ivory Wayans and Queen Mother Amelia Boynton Robinson, a civil rights heroine and icon whom the Minister met and sat with during a March 23 ceremony sponsored by the Emotional Emancipation Circle outreach and activism group. 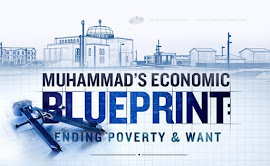 On March 21, Minister Farrakhan enjoyed a presentation by Scott Muhammad, director of SEED, Inc., who shared his success with growing food and working with high-risk students and Black farmers to create successful farming systems and land use strategies. Scott Muhammad was a major force in arranging events connected with the Minister’s visit to Tuskegee. Minister Farrakhan enjoyed a presentation by Scott Muhammad, director of SEED, Inc. who discussed his success at growing food, and working with high-risk students and Black farmers to create successful farming systems and land use strategies. There was also a presentation by Frank “Bishop” McDuffy, Jr., president of Laurinburg Institute in North Carolina, a Black boarding school that has turned around the lives of young Black men. Also present were Black farmers who shared their triumphs and challenges with the Minister. Minister Farrakhan took a tour of the Legacy Museum conducted by Dr. Jontyle Robinson. He appeared particularly interested in details related to Tuskegee’s history of medical experimentation. Minister Farrakhan toured the impressive Tuskegee University Archives, where Dana R. Chandler showed the delegation some of George Washington Carver’s research equipment and some of his hand written research notes. After greeting students as they snapped photos with their smart phones, the Minister traveled to the gravesite of university founder Booker T. Washington, and scientist George Washington Carver. Both are buried on the campus. Min. 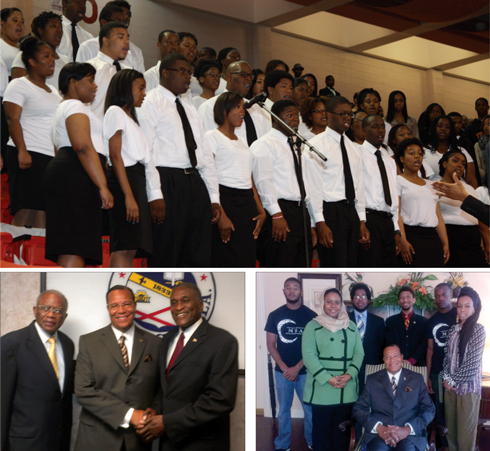 Farrakhan spoke Friday, March 22, to Macon County High schoolers prior to delivering his keynote address at the “Chappie” James Center. 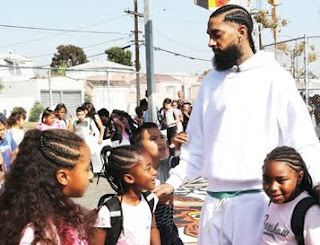 The next day, he sat for an interview and discussion with the Muslim Student Association before he was whisked off in caravan to the home of Ms. Robinson, the civil rights pioneer and icon. During that program, he was honored and presented with a colorful portrait of himself and Queen Mother Robinson, with moments of Black history as a backdrop in the painting. Afterward came a trip to the city’s Municipal Building for a meeting with spiritual, political and economic leaders, where the Minister delivered a message of unity and empowerment to over 300 people.